Recognising that insulated glass is an important factor for energy efficiency, FG Trading has introduced a double-glazing range which serves as an informative specification. Traditionally, double-glazed windows are considered essential for colder climates, but it can be just as efficient in temperate climates to reduce the heat coming through a window, as opposed to limiting heat loss, without a significant loss of light. Considering the energy necessary to change the interior temperature, together with recent electricity tariff hikes, energy efficiency should be a prime concern for those responsible for the design, specification and construction of new buildings. SANS 10400 Part XA and SANS 204 have played a major role in the specification of insulated glass in new buildings as double glazing offers significantly higher thermal performance over single glazing. Even the most basic unit comprising clear glass with a standard dehydrated airspace of 12mm will improve the energy efficiency of a window by over 50&percnt;. In addition, double glazing also increases wind load resistance, noise reduction and improved comfort behind the glass due to less radiation. The thermal performance of a double-glazed unit varies based on the size of the air cavity, the type and thickness of the glass, and whether the unit cavity is filled with dry air or an inert gas. To help guide AutoSpec users and uphold industry standards, FG Trading has introduced a double-glazing range which serves as an informative specification. 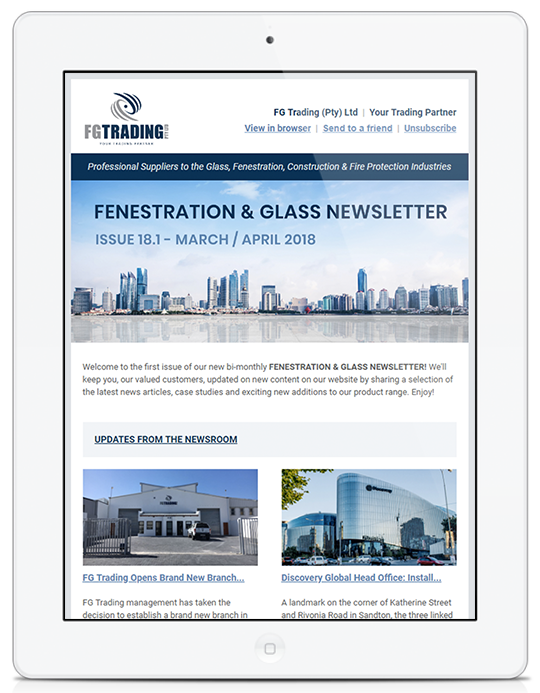 “We encourage architects and specifiers to seek assistance in specifying the correct combination of components to satisfy energy-efficiency requirements, as well as consult technical experts to prevent potential failure of double-glazed units,” advises FG Trading’s Laura Strydom. “It is imperative that the specifier verifies the source of the components as well as the type of system to ensure that only quality components are utilised, and supplied from a reputable and specialised supplier,” she adds.